PDS Site Coordinators function as liaisons between the Watson College of Education PDS partnership and the school site. They are the first line of communication between the PDS partners at the site and the WCE. They work proactively to promote the benefits of the partnership for all partners and assist in developing the professional growth of both the student interns and the teachers at their site. They serve as professional role models by consistently demonstrating excellence in teaching, leadership, and collegiality. Click here to find out more about the role and responsibilities of a PDS Site Coordinator. 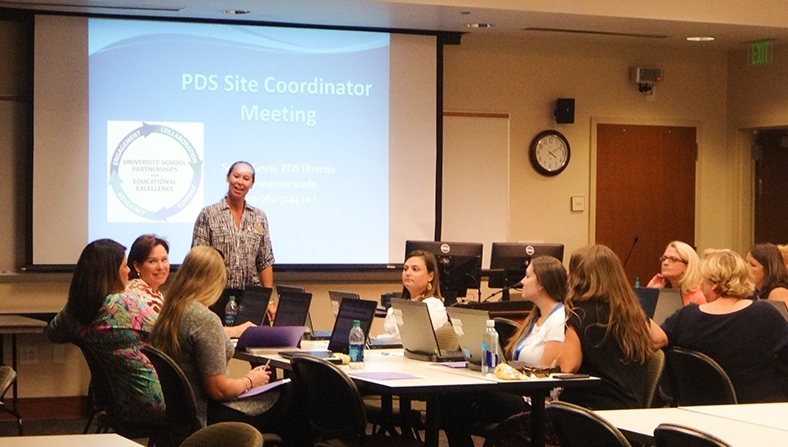 PDS Site Coordinators meet annually to discuss PDS processes, programs, successes and opportunities for growth. These meetings are available both face-to-face and online via WebEx. WebEx participants are asked to utilize a webcam and microphone to appropriately participate in each meeting. Site Coordinators who are anticipating placements at his/her school are required to attend. The edTPA is a performance-based assessment teacher candidates complete during their student teaching, which was designed by the Stanford Center for Learning and Assessment Equity (SCALE) and is currently being used in 35 states, as well as the District of Columbia as a summative assessment of teacher preparation. It consists of three tasks which align with one cycle of instruction in which teacher candidates plan 3-5 lessons (Task 1: Planning), video record themselves teaching those 3-5 lessons (Task 2: Instruction), and analyze student work (Task 3: Assessment). For each of the three tasks, candidates write commentaries to support and justify their planning decisions (Task 1), analyze their teaching (Task 2) and use data to inform instruction (Task 3). For additional information regarding edTPA, please use the links below and/or plan to attend one of the meetings listed above, or join us for one of the partnership teacher workshops noted on our PT site. PDS Partnership Teachers are referred by the PDS Site Coordinator and Principal of their school using the reference link in our Collaborative Portal. To review the criteria for recommending a Partnership Teacher click here. To recommend a Partnership Teacher, please access the Portal using the link below. Once you have entered the Portal, choose the School Planning tab to access the recommendation link. PDS Site Coordinators plan, structure, and lead 4 site seminars (to include an orientation) between and among student interns, partnership teachers, university supervisors and others involved in the partnership school efforts. Site seminars are designed to share information about school-based processes, prodedures, school culture, and/or general classroom practices. Seminars should allow adequate time for discussion and reflection. If school wide professional development allows time for discussion and collaboration, it should be considered a site seminar. Discussion should stem from a common issue and have relevance to all participants. The focus should be on informing future practice. Schools that are hosting one student intern are not required to host site seminars; however, Site Coordinators should still provide a school orientation, periodically touch base with the intern, and should include interns in school wide professional development opportunities, when appropriate. The WCE Collaborative Portal serves as the “go-to site” to retrieve all information, materials, and tools teachers will need to perform tasks efficiently and effectively as Site Coordinators. Site Coordinators can access the Collaborative Portal using the link below. If you do not know your username and password, please use the “Forgot” link on the sign in page to retrieve this information using your professional school email.